Godfather of shock rock Alice Cooper certainly has a flair for the theatrical. He was amongst the first to incorporate such wild antics as fake electric chairs, mock guillotines and having himself hanged to the sheer delight of enthralled audiences. His career has spanned over five decades and saw him rise to the top of the LA hard rock scene. Initially working with a band before splitting off as a solo artist, Alice Cooper was inducted into the Rock And Roll Hall of fame in 2011 with such hits as Elected, You And Me, Schools Out and Poison. Click HERE for your Alice Cooper tickets. 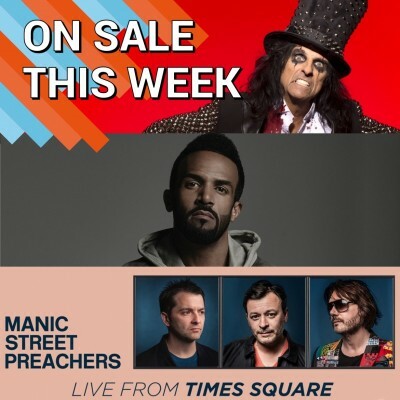 After enjoying the twentieth anniversary of their fourth record Everything Must Go in resplendent style, Manic Street Preachers are back to take over Newcastle having just been named as the latest headline act for the exciting Live From Times Square events. The Welsh wonders have teased fans with the prospect of a classic and melodious thirteenth studio album which, according to Nicky Wire, is inspired by the Electric Light Orchestra and we expect that some of the new material will be played at this huge outdoor show. Click HERE for your Manic Street Preachers tickets. Foodies everywhere are getting excited for the upcoming Great Food And Drink Festival. Offering hundreds of stalls selling a vast array of gastric delights, compelling demonstrations and a wide range of drinks which cater for all the family. Celebrity cooks and brilliant bakers will all be present to share their secrets and make you a master chef before you know it! Look forward to seeing the likes of Nancy Birtwhistle, Tom Kerridge, Simon Rimmer, Rustie Lee and many more. The touring show takes place at a variety of prestigious locations including Markeaton Park at Derby, Newstead Abbey at Ravenshead, Lincoln Castle and Hardwick Hall in Derbyshire so you can enjoy all the Great Food And Drink Festival has to offer at a venue near you! Click HERE for your Great Food & Drink Festival tickets. Derby certainly packs a punch. The mighty midlands town is home to many truly fantastic independent venues which showcase some of the top rising talent as they cut their teeth on the live circuit. Now the very best stages around the town are uniting for their second year to form 2Q Festival 2017. Mixing exciting established acts like Milburn, Temples and Pulled Apart By Horses with essential up and coming names you need to know such as Eyre Llew, These Wicked Rivers and Autumn Diet Plans, 2Q is quickly earning a reputation for being a vital event in the musical calendar. Taking place on Saturday 1st of April, you’d be a fool not to go so book your ticket before they are all snatched up. Click HERE for your 2Q tickets. Canadian R&B duo Daniel Daley and Nineteen85 (Paul Jefferies) make up the incredible new band DVSN. After recently releasing their debut album Sept. 5th they are ready to storm the UK with an epic London show to take place at KOKO on Friday 3rd of February. Tipped to be the big thing of 2017, get your tickets before they are gone. Brighton based band Black Honey truly broke in 2016. After catching everyone’s attention playing blistering festival sets, benefiting from prominent BBC Radio 1 airplay and supporting the likes of Ash on tour, the grunge informed fourpiece now prepare for their very own headline tour. Premium punk party Fat Lip Fest has just announced their first wave of amazing acts. Their three stages will be graced by the likes of Young Guns, Blood Youth, Feed The Rhino and many more yet to be announced. Taking place at Bristol Bierkeller and The Lanes on Saturday 29th of July, the day festival promises to deliver high octane action and energetic frenzied fun. Click HERE for your Fat Lip Fest tickets. For those of you begging for some Latin beats your cries have been answered by La Linea! Having built an international reputation for bringing together the very best Spanish and Portugese artists, 2017 looks set to be another amazing year. So sway your hips down to some of the finest London venues to enjoy a wide variety of eclectic performers this April. Tickets will be released at 10:00 tomorrow (Friday 13th January) so be sure to book yours before they are all snapped up. Click HERE for your La Linea tickets. Mind blowing music festival 110 Above have just released their Super Early Bird tickets for their three-day spectacular at Gopsall Hall farm in blissful August. They have yet to announced who will be playing this summer. But with previous years hosting the likes of Amber Run, Eliza And The Bear, Hudson Taylor and D.I.D., you can be sure that the line-up will be all killer and no filler! Click HERE for your 110 Above tickets. On sale right now we have East Midlands Chilli, Beer and Artisan Festival. This 5-star rated weekender is perfect for those with a taste for anything hot and spicy wanting to try more than 70 food stalls plus Real Ales and Craft Beers. Hosted by local hero ChilliBob, attendees of all ages are most welcome on his Orchard Farm just outside Nottingham where it is held from Friday 7th – Sunday 9th of July, 2017. Exeter punks Muncie Girls have been championed by the likes of Kerrang!, Rock Sound, Upset, Noisey, DIY, The Line of Best Fit & Punktastic. Following the release of their intense album From Caplan To Belsize last year, Lande, Dean and Luke will play a scorching set at The Cellar Bar in Oxford on Wednesday 15th of February.